Combat in the Pathfinder Roleplaying Game is efficient yet abstract. While the concept of hit points works well when envisioning a tense fight of blood, sweat, parrying, near misses, and fatigue, it falls on its knees the minute your character takes a solid and brutal blow to the head. How exactly are you supposed to adjudicate a broken arm, a gouged eye, a lacerated liver, or a crushed spine? 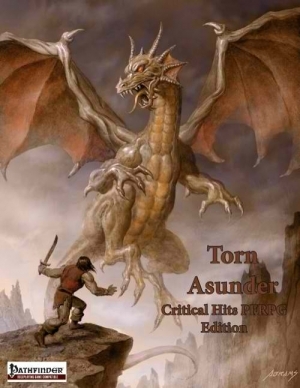 Torn Asunder: Critical Hits-Pathfinder Roleplaying Game Edition provides a complete, comprehensive and award-winning system for critical hits in any Pathfinder Roleplaying Game. The system is elegant and easy to use, it does not do away with hit points, or even alter the combat rules, it simply provides an optional way to deal with critical hits besides piling on additional damage. Critical hits are real hits-disabling function, mangling body parts, and leaving real wounds behind that have lasting effects. Torn Asunder pulls no punches; it provides a realistic and effective injury system for the Pathfinder Roleplaying Game, covering all creatures, anatomies, and body types. Included as well are rules for natural healing, scarification, and herbal treatments. Torn Asunder also provides a wide variety of resources allowing characters to take advantage of the new system, from quick and precise prestige classes to devastating weapons and spells to powerful and essential magical devices. Don’t just beat your opponents into submission, literally tear them limb from limb. ← Top Cow’s The Magdalena at DriveThruComics!